FRIDAY, OCT. 5 (5:30  7:30PM) A CELEBRATION OF HISTORY-MAKING NY STUDIOS: Dan Daley, prolific industry journalist, and contributor to WIRED, Fast Company and History Channel Magazine will moderate a panel featuring Quad Founder Lou Gonzales and original studio manager Laurel Gonzalez/Kerlew; studio architect, John Storyk; Blue Rock founder Eddie Korvin, studio manager Estelle Lazarus & engineer Jan Rathbun Horowitz; and Manhattan Center Chief Engineer Joel Schenuneman, and long term client, engineer Jimmy Douglass. Quad Studios (Madonna, Coldplay, Aerosmith, Tupac, LL Cool J, etc). and Manhattan Center (originally built by Oscar Hammerstein in 1906) are both celebrating 30th anniversaries this year. Blue Rock, was a highly regarded studio for over 16 years, racking up hits for The Kinks, Bob Dylan, and many other timeless artists. Artists, engineers, producers, and surprise guests will celebrate the glory days and the continuing legacy of these classic NY Studios. SATURDAY, OCT. 6 (5:00  7:00PM) LEGENDS OF NASHVILLE SOUND / HISTORY OF NASHVILLES RECORDING STUDIOS: Co-chairs Jim Kaiser and Bil VornDick, AES Nashville Section will trace the evolution of Nashvilles recording industry. Starting in the 1940's with facilities in local radio stations like WSM, and Castle Recording Studios in 1946. The need for more professional facilities grew with the dominance of live programming from the Grand Ole Opry in country radio, and the move by major labels such as Victor, Columbia, and Decca to Nashville. In 1954 Owen and Harold Bradley moved their studio to 16th Avenue South, initiating "Music Row" with a string of hits by Patsy Cline. Designed in 1957 on a napkin by Chet Atkins and his engineer Bill Miltenburg, RCA Studio B, served twenty years recording Perry Como, The Everly Brothers, Willie Nelson, Charlie Pride, Dolly Parton, Roy Orbison, Elvis and countless other stars. This event will feature video, audio and surprise guests revisiting one of the most prolific times in Americas musical history. SUNDAY, OCT. 7: THE HISTORY OF SURROUND PARTS I & II - Robert Auld, Audio Engineer/Sound Designer and principal Auldworks, NY-based recording facility  will present a comprehensive assessment of the origin and early development of this still evolving medium. The Beginning 1925  1940: (9:30 -11:30AM) will range from the introduction of the first 78 rpm discs to the first multichannel surround movie sound track recorded by Leopold Stokowski for Disneys Fantasia. Part II (2:00  4:00PM) Quadraphonic Sound In The 1970s, will explore the mass confusion as two tape and five disc formats competed in the marketplace, while producers and engineers continued to create timeless recordings. SUNDAY, OCT. 7 (4:30  7:30PM) CHAOS BEGETS ORDER: LIVE SOUND BECOMES AN INDUSTRY: John Chester, Chief Sound Engineer for Bill Graham's fabled Fillmore East and designer of major pieces of equipment used by Graham's FM Productions in the 1970's, will lead attendees on an unforgettable trek through rock's halcyon days. Celebrated FOH pros such as Bill Hanley, Dinky Dawson and Roy Clair will share real world adventures ranging from Newport Jazz to creating the sound system for the Woodstock Festival, Fleetwood Mac in 1967; Steely Dan; The Four Seasons; The Rolling Stones. And -- building a mixing console for a Bob Dylan tour from scratch in less than six weeks! The 123rd AES Convention will be held in NYCs Jacob Javits Convention Center, October 5-8, 2007. For registration and housing information and for a detailed Preliminary Calendar of Events please visit www.aes.org. 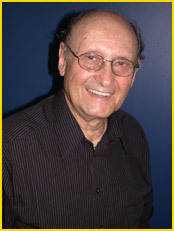 Photo Caption: 123rd AES Convention Historical Chair Harry Hirsch.